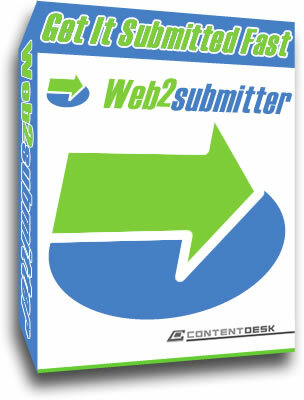 Web2Submitter - Web2.0 Auto Submission is Web 2.0 marketing tool can dramatically Increase your Traffic While Saving Hours Of Time. Submit your site to several of the most high-traffic Web 2.0 news sites on the internet at one time. Enter the content of your latest blog post one-time and submit to all of the sites individually for maximum efficiency. It is very easy to use, so a new or experience Web 2.0 marketer can benefit from Web2Submitter. ...... 0 marketer can benefit from the software. * Saves and automatically processes logins for several of the most high-traffic Web 2.0 news sites on the internet. * Easily archive your stories (blog post) to make every submission extremely easy and gives you the ability to recall it later. * With the push of a button, the software fills the forms on these sites so all you have to do is review and submit your story. * Enter the content of your latest blog post one-time and submit to all of the sites individually for maximum efficiency. * Web2Submitter is a certified white-hat tool for promoting your content... nothing shady is going on with Web2Submitter. It was created solely to save you precious time. * Saves you hours of time by streamlining your promotion process for Web 2.0 sites. Your time is being used efficiently. Everyone should believe in automatic directory submission. Enjoy website submission.website submission - enjoy the difference. It's not a dream. website submission is real. directory submission seo - be prepared.Go farther with directory submission seo. article submission directory - One name. One legend. directory submission software - empowering people. Qweas is providing links to Web2Submitter - Web2.0 Auto Submission 1.9 as a courtesy, and makes no representations regarding Web2Submitter - Web2.0 Auto Submission or any other applications or any information related thereto. Any questions, complaints or claims regarding this application Web2Submitter - Web2.0 Auto Submission 1.9 must be directed to the appropriate software vendor. You may click the publisher link of Web2Submitter - Web2.0 Auto Submission on the top of this page to get more details about the vendor.